What was your biggest achievement at the age of 15? 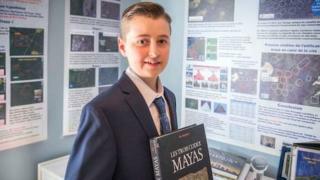 Well, a Canadian teenager may have outshone the experts after discovering a lost Mayan city. William Gadoury, from Saint-Jean-de-Matha, Quebec, made the discovery by comparing star charts with satellite images. The new city, discovered in a Mexican jungle, is thought to be the fourth biggest Mayan city, and has been named 'Mouth of Fire' by the teenager. The revelation went viral after a report on the findings was posted on Reddit - with hundreds of commenters amazed by the teenager's discovery. William has been fascinated by the Mayans for much of his childhood, ever since a Mayan calendar predicting the 2012 apocalypse sparked his interest. Thankfully, the teenager had a close relationship with the Canadian Space Agency (CSA) - he had won a science competition a year earlier for his theory - and they had already been providing him with images from their RADARSAT-2 satellite, which has cutting-edge terrain mapping abilities. They gave him images of the new location. He also scoured the internet for other satellite images from 2005, when a fire had engulfed the area leaving it more exposed - and any remains more visible. His findings have been met with widespread praise, with scientists from the Canadian Space Agency describing his work as 'exceptional'. They also presented him with a medal of merit. William named the city K'ÀAK 'CHI' which means Mouth of Fire. So what next for William? He plans to go to the International Science Fair in Brazil in 2017 to present his findings. He also hopes that archaeologists will visit the site very soon. On the possibility of an archaeological dig, Rocque is realistic, telling The Montreal Journal "It's always about money. An expedition's costs are horribly expensive". Regardless, William's legacy will almost certainly be etched into history. According to reports, the findings are soon to be published in a scientific journal, and it is thought that methods similar to his could lead to the discovery of more lost Mayan Cities. Update: Since publication of this article some other experts have expressed scepticism at William's findings. Dr. David Stuart, an anthropologist from The Mesoamerica Center, University of Texas posted a response on Facebook claiming 'ancient Maya didn't plot their ancient cities according to constellations'. Stuart - an expert on the Maya Civilisation - described the square feature as an 'old fallow cornfield'.